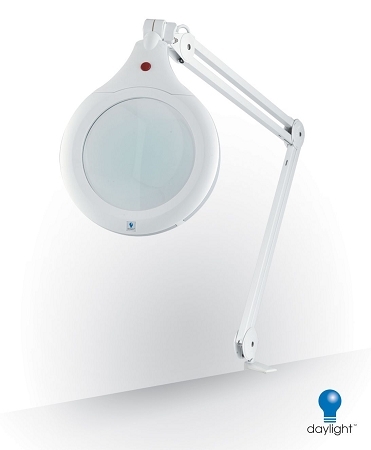 The Slim Line Magnifier is a powerful lamp. It's light (5 lbs.) weight is ideal for work stations, benches and large tables. This 28w bulb provides the Full Spectrum lighting technology to reduce eye strain and headaches. All Daylight bulbs use 80% less energy than the standard magnifiers on the market today. The Slim Line Magnifier has two interchangeable lens. A 3diopter lens with a 1.75x magnification provides a larger viewing area than a standard magnifying lens. The 5diopter lens (U61001) has 2.25x magnification. Sold separately. With an increased diopter you will gain room between the work unit and lens providing a larger work space for hands and tools. This unit has a "Stay as positioned" feature to help reduce readjusting the lens, keeping hands free and minds focused. U61002 8-Diopter Lens (3x Magnification) - This lens has been discontinued, however The WaveRoom Plus does have them in stock. Act Fast only available while supplies last!